Husband Material is a long-running reality show, where eighteen lucky guys compete for the hand of one lucky lady. Meet contestant number one, Riley. Since being left at the altar, he’s hit the gym to get into the best shape of his life. Now he’s in it to win it. Contestant number two, Asher, doesn’t really want the bachelorette; he needs the prize money for his sister’s cancer treatment. Asher’s upbeat personality brings Riley out of the funk he’s been in since his breakup. They make a formidable team, with one complication: Asher’s falling for Riley. As always, Mayne’s observations are sharp and his descriptions are vivid. Good satire is always a little uncomfortable but Mayne manages to keep his story light and sweet. This isn’t quite as tender as his earlier books, but it is just as funny. Mayne has retained his sense of the absurd and his ability to make us laugh. He has also kept the muscles while adding body paint and a sauna. Creating another pair of characters as addictive as Brandt and Donnelly was an impossible task. Riley and Asher are very different men. Especially with Mayne’s gentle mockery of whole reality TV genre, it took me a while to warm to his contestants. But they grew on me. By the mid point of the novel, I was cheering them on. By the end, I was thrilled that Mayne had set them up for a sequel. My one quibble with the book happened quite near the end. I’m almost certain the main character’s chivalrous act of self-sacrifice could be considered sexual assault. Never mind. A minor niggle in a great book. Xavier Mayne is the pen name of a professor of English who works at a university in the Midwest United States. Versed in academic theories of sexual identity, he is passionate about writing stories in which men experience a love that pushes them beyond the boundaries they thought defined their sexuality. 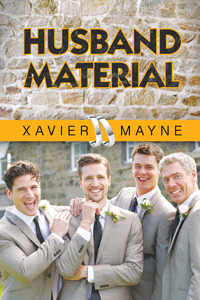 He believes that romance can be hot, funny, and sweet in equal measure.The name Xavier Mayne is a tribute to the pioneering gay author Edward Prime-Stevenson, who also used it as a pen name. He wrote the first openly gay novel by an American, 1906’s Imre: A Memorandum, which depicts two masculine men falling in love despite social pressures that attempt to keep them apart.